Home » Seiko 6810-8000 (SCVL001): Japanese Piaget? It took over 6 decades, but Seiko has finally earned a place in the pantheon of fine watchmakers. Not that the company didn’t produce fine watches much earlier: My 1968 King Seiko is easily as nice as my Swiss pieces from that era. But enthusiasts had been reluctant to welcome the Japanese watchmaker into their consciousness until the last decade or so. Seiko earned their respect by producing fine mechanical watches in the Grand Seiko line, punctuated by true haute horology under the Credor banner. Although many watch fans know of Seik0’s fine mechanical movements, especially their “Hi-Beat” Grand Seiko, King Seiko, and Lord Marvel pieces and the modern Credor, Cal. 6810 is a little less familiar and a lot more special. Here’s the story. Seiko’s quest for greatness in the 1960’s focused on development of world-class mechanical movements. Beginning with the Lord Marvel and progressing through that decade with the Grand Seiko and King Seiko, two competing factions produced ever-better movement innovations. Suwa Seikosha originated the Grand Seiko line, but it was Daini Seikosha who perfected it with the famous 44GS of 1967. The company produced over a dozen movement families in that decade, with Suwa and Daini progressively refining automatic winding, high-beat accuracy, and ultra-thin movement technology. This latter element is less-understood, even among Seiko enthusiasts. But the 1969 introduction of Cal. 6800 was just as important a milestone in watchmaking as the “Hi-Beat” Cal. 5740 or long-lived Cal. 5200 stream. 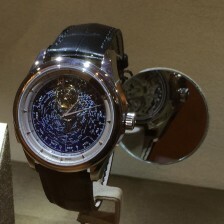 Although it did not surpass the famed 1.75 mm F. Piguet Cal. 21 in thinness, Seiko’s Cal. 6800 is still a remarkable achievement at 1.98 mm1. It is likely that Seiko had set the 2 mm Piaget 9P as their target, as it was all the rage in the 1960’s. Perhaps this is why they came in a mere .02 mm thinner, though this is a fudge since it does not include the cannon pinion or hour wheel! It is a classic 17-jewel design with the addition of four non-counted jewels used to separate the exposed mainspring from the plate. The initial Cal. 6800 was a tonneau-shaped movement but a round version, Cal. 6810, appeared in 1973. Like the Swiss competition, Seiko de-emphasized mechanical movements in the 1970’s, halting production of Cal. 6810 in 1978. And like the Swiss, Seiko re-started production of fine mechanical in the 1990’s as enthusiasts clamored for a classier alternative to quartz. Cal. 6810 was re-introduced in 1991 in the “U.T.D.” (“ultra-thin dress”) watch, model 6810-6000, as part of a commemoration of the company’s 110th anniversary. It remains in occasional production even today. In my opinion, SCVL001 is the more-attractive of the two, with the minimalism of the slim no-seconds watch emphasized by the delicate index markers. This particular example has been listed by the seller on various sites for 6 months. It appears to be in excellent condition, with even the original tags retained along with the box. And he sounds like a real enthusiast, judging by his presence on various watch sites and his collection. He has asked between $2,999 and $3,499 for the piece, which is a fair price for the model and condition. His watch is now listed on eBay with bidding just starting. If you are interested in a Seiko ultra-thin dress watch, this is the one to buy! Note: I believe that the case is steel, but wish it was white gold. And I can’t be sure of the year of manufacture, since very little information on this model is available online.